Imagine the sensation of standing in a club or at a gig and the speaker system sending vibrations up and down your body. That's basically the idea behind Basslet. It's a €139 portable subwoofer that fits your wrist to help you feel the music. If you like listening to house or trance music where there's plenty of bass, Basslet promises to effortlessly create that. Packing in the power and accuracy of a large speaker into a device the size of a watch, it's the creation of Lofelt co-founders Daniel Büttner and Gwydion ap Dafydd. 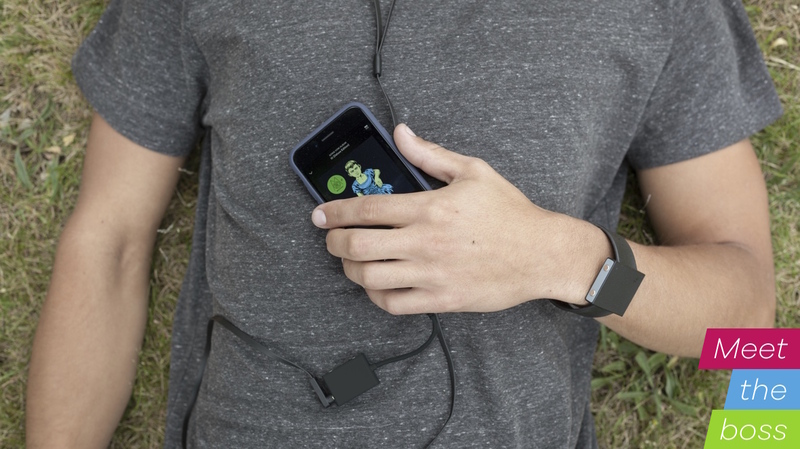 Büttner, a professionally trained bass player who previously worked with music tech companies, tells us that the audio enhancing wearable was designed to create a very accurate representation of music. It's been two years in the works and has gone through several iterations and plenty of user testing. Now the team is confident enough that they have a product that works. "For us, I see us as a natural extension for the headphone space," Büttner explains to us. "We are completing an experience that is incomplete. The headphone creates 60% of the experience and from that perspective there is a definitely a big market there." So how does it all work? The setup comes in two parts. There's the Basslet wearable that looks like a screen-less smartwatch and includes the company's LoSound engine to recreate bass frequencies down to 10HZ to give that feeling of a subwoofer on the wrist. The setup is completed by a sender that plugs into your smartphone's headphone jack or audio device. The decision to include the sender was based on user feedback. "People thought it was great, but they really wanted to hook it up to a PlayStation, VR headset or stereo," Büttner said. "This way you can plug it into anything with a headphone jack. We took this very seriously. How can we make something that's wireless, yet compatible with all the existing audio devices? "We also had to focus on making the latency between the sender and the wearable as short as possible so we have achieved something around 10 milliseconds. If the vibration is out of sync, it doesn't work." Building the technology that's usually reserved for much larger spaces threw up some obvious technical challenges. "Even with the first prototype, I wasn't really sure if it was going to work," Büttner explains. How could something on your wrist give you an immersive music experience? Does the ultimate running + music wearable exist? Could someone please build a running wearable that plays nice with my playlists? "We tried a lot of vibrating technology at the beginning but we couldn't find anything on the market," he said. "We had to try and create these massive bass frequencies in such a small size. We spent a lot of time looking at the experts in the field, the mechanical engineers in haptics and robotics. We were really fortunate to be able to work with a robotics engineer based in Paris. "We developed our own LoSound engine. The principle is that you have magnets and you have a coil around it, but the difference is that we use different magnetic flows and also a very unique membrane chip to create something that's very accurate and efficient." Positioning of the tech was also crucial and Büttner explains why Lofelt chose to focus on the wrist. "It's good to have the tech where your body is sensitive like the wrist or the chest," he said. "It doesn't have to cover your entire body. Provided that both signals are in sync, your brain kind of complements for that. You can apply this vibration to any part of the body and your brain will compensate for the gaps that are there. We made a conscious decision to start with the wrist. It is a very sensitive part of your body because it's also where you have things like your pulse." Along with creating something that felt natural and small that didn't stick away from the wrist, Büttner also had a noise issue to deal with as well. "We put a lot of effort into making the motor move silently and not move into air. Our claim is that you can sit in a library or the train and you won't bother the person sitting next to you." Basslet isn't the first wearable subwoofer promising to bring the bass to your body. If you've been watching the NBA Finals recently, you might have spotted Cleveland Cavs' Kyrie Irving showing off the SubPac M2, a backpack that uses haptic feedback technology that lets users feel explosions and in-game audio. It's being backed by some big names including Google Android co-creator Andy Rubin and music producer Timbaland. Büttner is well aware of the competition but is keen to point out some key differences that he believes makes Basslet an entirely different proposition. "While SubPac is aimed at the pro users like producers and gamers, we are looking at a wider mass market," he says. "There's nothing out there really in the mobile space that everybody can use and you can put on in the morning like a watch. It was also very important for us to put the vibrations directly against the skin and not have any layers in between. So if you're wearing a sweater or a jacket and put the vibrations on the outside, it's almost like wearing a pair of sunglasses between a VR headset. You don't get the full impact of the experience. The whole size and form factor is really important to us." While the focus is on this one device and making it the best it can possibly be, the team has already thought about other potential uses beyond providing a more immersive audio experience. "One idea is a version for the smart home where you have a bigger Basslet device that could become your couch," Büttner tells us. "A lot of music makers create music on their laptops and now if you have something like the Basslet, you can get much more energy from your music and a much more inspiring way to music. "You could also imagine a sports version that comes with a chest strap. Not to suggest that we are doing that, though. For the future, there is also the potential to integrate with existing hardware so you could see a Fitbit in the future having Basslet functionality." One of the most interesting uses, though, much like SubPac, lies in the VR realms and it's something that has already been played with. "We've already tested the Basslet with VR headsets, Büttner tells us. "We visited Hong Kong and met with someone from HTC and hooked it up to the Vive. It's actually amazing. You have the headset on and gun in your hand and as you shoot, you can feel any actions in the game, on your hand and not on your back like the SubPac. We can put the feedback directly on the arm." Basslet's Kickstarter campaign is now live and the company has very clear intentions of what it hopes to achieve (aside from raising the money). "We really want to build a community to understand how people experience Basslet," Büttner explains. "The tricky thing is that we are building an experience that you can't see and is something you really need to try. It's about giving us the best chance of showing people how it works."